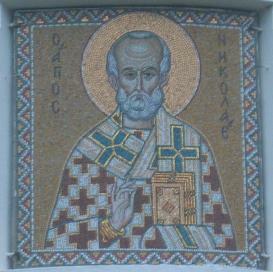 The term mosaic in meaning determines the image maded from colored stones, glazes or ceramic tiles of different colors. In Church architecture the mosaic portray the Saviour, His Mother, Bible scene or the Saint of which name the temple is devoted. The term mosaic represents architecture as the general way of using this technique decor for buildings facades decoration.